This paper presents a new method of ultrasonic flaw detection for small and medium diameter pipe bends with thin pipe walls. Based on detailed analysis of frequently encountered problems in ultrasonic flaw detector for such pipe bends, a double piezocrystal ultrasonic detector with a concave surface has been developed and proved to be efficient for practical use. Pipelines with small and medium diameter and thin pipe walls are generally used for boilers in thermal power plants, as down comer, steam-water communicating pipe, blow-off pipe and drainage, etc. This type of pipeline usually has a dimension of 89-159mm and a wall thickness range from 4 to12mm,and is normally installed outside the boiler, some near footway. Cold bending is commonly used where a bend is necessary. No tempering is applied even if hot bending is used. As a result, significant stresses remain within the pipe wall of these bends after the bending process, with higher stress in the outer-arc, where pipe wall thickness is usually reduced during the process. For operation conditions, corrosive media inside the pipeline will cause corrosion of the pipe wall, and stress cracks will be formed in the outer-arc pipe wall due to the joint effects of the corrosion and residual stresses. The pipeline will burst when such cracks reach a critical size. Another cause of pipeline bursting is that steel pipes with cracked or folded pipe walls were used for bending. Pipeline bursting of this kind will result in emissions of high temperature, high pressure media, which may cause personal hazards and heavy losses.Fig.1 shows the pattern of a down comer bend bursting at the 16m platform of the No.5 Boiler at Xigu Thermal Power Plant in 1996. Fig.2. Therefore, is the cracking formation of the ignition pipeline of No.6 Boiler at the same plant. It is of crucial importance to conduct regular monitoring and inspecting operation for this type of bends. In spite of its high sensitivity, the method of the radioisotope test has very limited uses because it is time-consuming, difficult to operate, small in detection scale, dangerous to the operator. Besides, when several bends are arranged in parallel, detection can not be carried out. Because of the point-to-point or line-to-line contact between the conventional detector and the testing sample, it is rather difficult for the detector to beam ultrasonic wave into the pipe bends due to the unregular convex surface of the outer-arc at a pipe bend. To achieve a good contact, the detector need to have a concave surface through grinding (see Fig.3). However, such a grinding process will change all the other pre-set parameters of the detector. Besides, the thickness of the ground wedge of the ultrasonic detector will be greatly reduced and the operation life of the detector will be substantially shortened. Also, the noise level on the monitoring screen will be increased and the accuracy of flaw recognition will be affected (see Fig.4). Because the testing object to be inspected has a thickness of 4-12mm,it is obvious that the traditional detector is not feasible for inspection of such pipe bends. Considering all the factors stated above, it is clear that traditional ultrasonic detectors can not possibly be used to conduct flaw inspection for small and medium diameter pipe bends. 3.1 A double piezocrystal ultrasonic detector uses two piezocrystals for emission and receiving purposes respectively, and can greatly reduce the noise reflected from polymethyl methacrylate/steel surfaces. The initiating pulse cannot enter the amplifier and will not be amplified throughout the process. Therefore jamming is eliminated. This helps to significantly decrease the size of the blind inspection zone, and facilitates the detection of flaws close to the surface. Ultrasonic beams from the two piezocrystals form a diamond-shaped area (see Fig,6), within which the reflected signals are strong, especially at the point where the axes of the two ultrasonic beams meet. This provides a powerful tool for thin wall pipeline flaw detection. 3.2 As stated above, if traditional flat-surface detectors are used for the convex outer-arc of the bend, the detector and the testing object cannot fit each other properly. If the detector is ground to have a concave surface, effective operation thickness of the detector wedge will be reduced and the noise level will rise. To solve these problems, one additional wedge is installed at the trailing edge of the detector (see Fig.7). 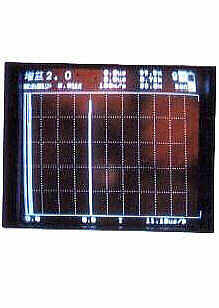 The ultrasonic detector developed is shown in Fig.9. A testing block has been developed to test the detector, determine its sensitivity and adjust the rate of sweep speed (see Fig.10). The testing block has an R=70mm to represent general conditions. A semicircular arc-surface with R=40mm is mounted on the testing block to determine the incidence point of the detector. Two arc-surfaces are built, with r=65 and 60 mm, wall thickness 5 and 10mm,respectively, for the rate of sweep speed adjusting purposes. On each surface three 0.2×0.5 grooves are cut. Point a is the incidence point of the detector when it is place at position I and the reflected signal reaches the highest level. Find out the position of the 0.5mm line cuts at distance of 5mm and 10mm by placing the detector at positions II and III on the testing block, respectively. Then adjustment is made to achieve scales of 1:1 or 2:1 on the monitoring screen. In accordance with industrial regulations, the sensitivity for flaw detection on a new pipe should be set at 8% or 10%of the reflection amplitude. However, no sensitivity standard has yet been made for inspecting operating pipelines. If a 0.5mm line cut is used for sensitivity adjustment for inspecting an operating pipeline, the detector may fail to detect some flaws. This is because in practice it has been found out that after the formation of cracks in operating pipelines, corrosion products, such as Fe3O4, in the cracks will absorb some ultrasonic wave so that the reflected signal will be weakened. Therefore, in order to successfully detect a 0.5mm crack, the detector sensitivity required must be higher than that set for the 0.5mm line cut on a new pipe. Experiment shows that this will require a 3~8dB increase on the basis of the 80% amplitude for 0.5mm line cut detection. In practice, an increase of 5mm or 10mm is chosen, depending on the thickness of the testing object. For testing objects with a thickness of 4-6mm, sensitivity adjustment should use the line cut at the place of 5mm; for thickness between 8-12mm,use the line cut at the place of 10mm. Fig.12 shows the actual wave pattern during a flaw detection operation. Wave patterns indicating flaws need to be analyzed carefully to decide they might imply a corrosion pit or a crack. Corrosion pits usually do not exceed a length of 10mm, and are scattered all over, i.e., they can be found at different locations on the pipe wall. A crack flaw can be distinctly identified if it is longer than 12mm, and is located within 45°to both sides of the outer-arc, and within 10mm from both sides of the normal direction. The above-described testing block and double piezocrystal detector with a concave surface have been used to inspect about 500 bends of down comer and steam-water communicating pipes on 17 boilers at 10 thermal power plants. Cracks were detected on more than 20 pipe bends on several boilers at Xigu Thermal Power Plant and 803 Power Plant. Replacement of these flawed bends has been carried out accordingly. Some of the crack patterns are shown in the dissection photos (a) and (b). A double piezocrystal ultrasonic detector is developed and it serves better the purpose of flaw detection for thin wall pipe bends, especially when the crack is minute. A testing block is built which meets the needs for detector testing and equipment adjustment. This approach is based on theoretical analysis and has satisfactory practical applications. Ultrasonic Flaw Detection, Water Conservancy Publishing Company, 1980.